Bryan Kneale was born in Douglas, Isle of Man, in 1930. He studied at Douglas School of Art (1947) and at the Royal Academy Schools, London (1948-52). In 1948 he won the Rome Prize, and spent most of his time travelling in Italy where he was greatly influenced by the work of the Futurists and metaphysical painters. His early ambition was to be a painter, and on returning to London in 1951 he started to paint with palette knives in a desire to 'construct' with paint. In 1960, having learnt welding techniques, Bryan Kneale turned to three dimensions and held his first exhibition of sculpture. 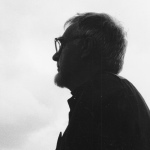 A teacher for most of his career, Kneale was Head of Sculpture at Hornsey College of Art and Design (1968) and Professor of Sculpture at the Royal Academy Schools (1980-87). He held successive posts at the Royal College of Art, as Tutor (1963-80), Senior Tutor (1980-85), Head of Sculpture (1985-90) and Professor of Drawing (1990-95). There is no doubt that teaching had the effect of slowing Kneale's progression as a sculptor, and since his retirement form the Royal College in 1995 his sculpture has developed rapidly. An overriding characteristic in his work is an emphasis on linkages: the way in which separate forms are conjoined. Skeletons and joints of animals were explored through drawing and construction in metal. Kneale prefers to work directly in metal rather than modelling in an intermediary material before casting. Recent pieces have been constructed from spun steel domes, which he cuts and realigns in abstract forms and finishes in a variety of ways. Kneale has maintained a busy exhibiting schedule, with regular solo exhibitions since 1953 and group exhibitions since 1961. He has shown mostly in Britain with occasional exhibitions abroad, and his work is represented in collections from Australia and New Zealand to Brazil and the United States of America. Only 30 can be viewed by the public.